Just as punk will never die, neither will its all-stars. The Clash and The Ramones may be consigned to the annuls of time as far as active bands are concerned, but their influence still seeps down through the genre’s current crop. But in terms of the old guard who are still alive and kicking, that statement is even more true – their output may not reach the heady heights of their most lauded releases, but the albums keep being pumped out regardless. As far as NOFX are concerned, they kind of have to keep going. While their status as irreverent punk figureheads has become fleshed out in terms of younger acts following the same path, the Californians still remain the go-to act for conscious punk with a bit of humour sprinkled for good measure, even when they admit themselves that some of their albums could have a bit more effort put into them. At any rate, First Ditch Effort is NOFX essentially being themselves, rattling through another collection of witty, snide skate-punk jams that’s pretty much as enjoyable as ever. The thing with NOFX is that, even when they’re the first to admit they’re phoning it in, there’s still a certain degree of enjoyability to be had, and on an album like this where there’s clearly been some effort put in to its construction, that’s a factor that swells in prominence. And just like NOFX have become known for, First Ditch Effort tackles hard-hitting issues with humour for a vestige of extra palatability. California Drought sees frontman Fat Mike detailing his current sobriety, though twisting it to emphasise its difficulty and initial unattractiveness in a way that isn’t often explored, and Oxy-Moronic takes a jab at the prescription drug industry through the tried-and-tested means of puns. It doesn’t always work – I’m A Transvest-lite sometimes feels a bit too corny to be really funny – but there’s a typical mix of wry humour and unpredictability that’s served NOFX well in the past, and here is no different. Though at this point First Ditch Effort may seem like nothing more than par for the course for NOFX, there’s a definite sense of growing up on this album that isn’t masked by humour. I’m So Sorry Tony serves as a genuinely heartwarming tribute to late No Use For A Name frontman Tony Sly, Generation Z sees the band touching on the state of the world caused by their generation and how the current one will be who feels the repercussions, and, though it’s a bit of a heavy-handed exploration of Fat Mike’s own transvestism, I’m A Transvest-lite at least has its heart in the right place with its message of being yourself. There’s definitely a rift between these sorts of tracks and the more comedy-oriented ones like Dead Beat Mom or Bye, Bye Biopsy Girl, both in terms of tone and quality (especially Generation Z, whose spoken-word rants and relatively long runtime feel more than a bit uncomfortable), but there’s a lightness in touch that mitigates such a divide, and because of this it’s a fairly smooth listening experience overall. And with this album instrumentally comprising of the same melodic, rousing punk that NOFX have made their calling card pretty much across the board (another reason that Generation Z‘s weaknesses are as prominent as they are), said smoothness is only emphasised. As a result, First Ditch Effort is NOFX’s strongest effort in years, one with zero pretentiousness that just pumps out conscious, entertaining punk jams thick and fast. Because, for all of NOFX’s shtick of not trying, these are the sorts of highs they can reach when they do. No, it’s not going to change the world, but there’s a vibrancy and vitality to this album that anyone can get behind. For a not exactly long-lasting but still satisfying fix of punk, First Ditch Effort should be the first point of call. 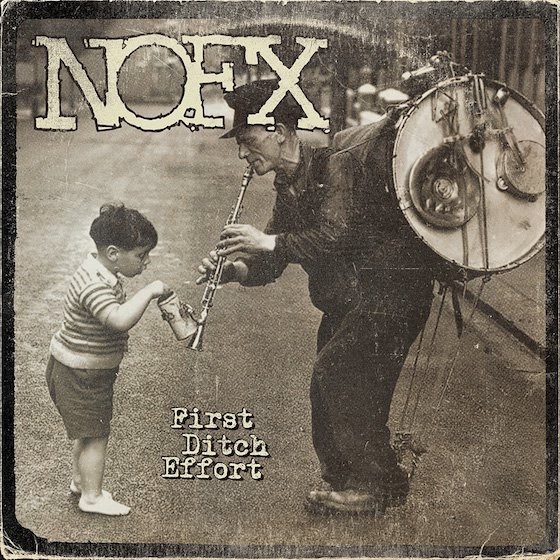 ‘First Ditch Effort’ by NOFX is out now on Fat Wreck Chords.